There's a welcoming environment at this restaurant which is well designed for families and groups of friends who want to grab lunch or dinner together and shoot the breeze. The menu includes a variety of handcrafted pizzas, pastas, salads, paninis, and desserts, all at very good prices. While at a recent Palm Beach Outlet’s Cars & Coffee event I discovered Cucina Pizza by Design on my way out. I had liked so much their Florentine pizza that day that I decided to come back for lunch this past weekend. The restaurant is nestled in the Palm Beach Outlet Marketplace, just a few feet away from the Whole Foods Market. Its decoration is very appealing, with a dining area properly arranged for customers to enjoy the major component of the restaurant concept which features the comforts of modern Italian eateries. 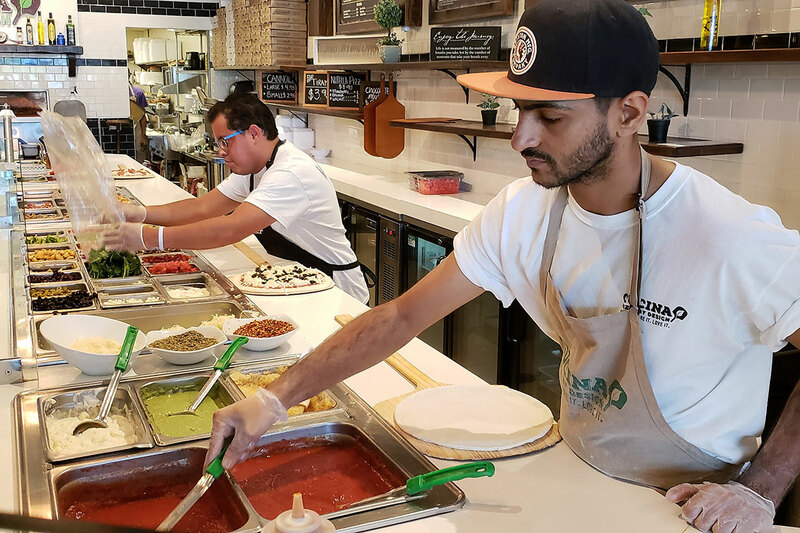 The Cucina Pizza by Design experience starts when you enter the restaurant and artsy feet painted on the floor lead your way to the counter where you start customizing your order. The process is simple and fun and if you are dining in, once you complete your order just head to your table and a server will bring your food. Big boards hang on the wall with the menu typed in bold, fancy fonts, including different handcrafted pizzas to go with if you want to skip the process of customizing your own crust topping. Chef’s suggestions start with Margherita pizza made with classic marinara sauce, mozzarella cheese, basil, oregano, and E.V.O.O. For your information, E.V.O.O. stands for Extra Virgin Olive Oil and it is the natural juice squeezed from olives one day after the harvest. So, Cucina Pizza by Design is actually giving customers the highest grade for the best, unrefined and unprocessed oil in their pizza. The Artisan Pizza movement in the United States has seen a jump in traditional pizzas. You can find a traditional Margherita created in many places. Many places! My partner in ‘food’ crimes is a fan of Margherita pizzas, so she went with it. Out of all other Chef crafted pizzas being suggested which include BBQ Chicken Pizza, Alfredo Chicken & Fresh Pear, Florentine, and Bianco Romano, I decided to give the house a try and I went for their Cucina Signature, a white pizza that comes with garlic, Mozzarella, Ricotta, Romano cheese, roasted chicken, sun-dried tomatoes, spinach, and of course, E.V.O.O. Romaine lettuce, cherry tomatoes, cucumbers, garbanzo beans, kalamata olives (one of my favorite olives), pepperoncini, red onion, ham, Genoa salami, and Gorgonzola with balsamic vinaigrette. That was simply a perfect starter to share before our pizzas arrived. That motto is everywhere at the restaurant. It’s what seems to drive Cucina Pizza by Design staff. Nowhere else have I seen restaurant people having so much fun at work, even when they’re getting busy with orders. I enjoyed to see one of the chefs put on a show while making our pizza. He shaped the dough into a ball and on a lightly floured surface he pressed down with floured fingertips to shape the dough into a small, flat disk, and pushed the dough outward making the disk larger. Then he draped the dough over his palm and forearm and started slapping it and finished with a couple of tosses up in the air. 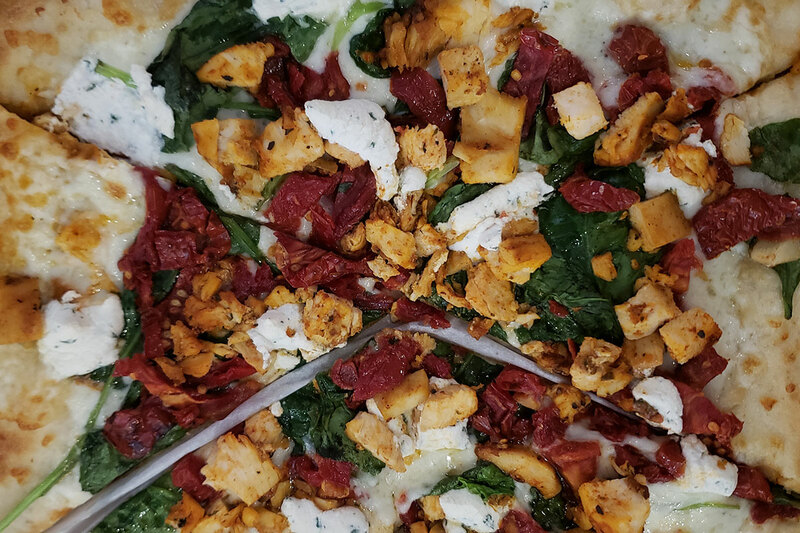 Beyond the opportunity to customizing your crust —gluten-free, classic and multigrain— and choosing the ingredientes you want for your topping, Cucina Pizza by Design is fast. The pizza is cooked in a stone oven in about a couple of minutes, and served crispy and deliciously hot. The restaurant offers a welcoming environment and is well designed for families and groups of friends who want to grab lunch or dinner together and shoot the breeze. Their forest green and natural woods concept enhances the modern industrial decoration on the walls adorned with live herb plants, artistic illustrations, and eco-friendly “green” designs. Cucina is open daily from 11am to 10pm and they usually have weekly in-house and online offers you can keep track of at www.cucinapizza.com. Customers can also order delivery or take out. 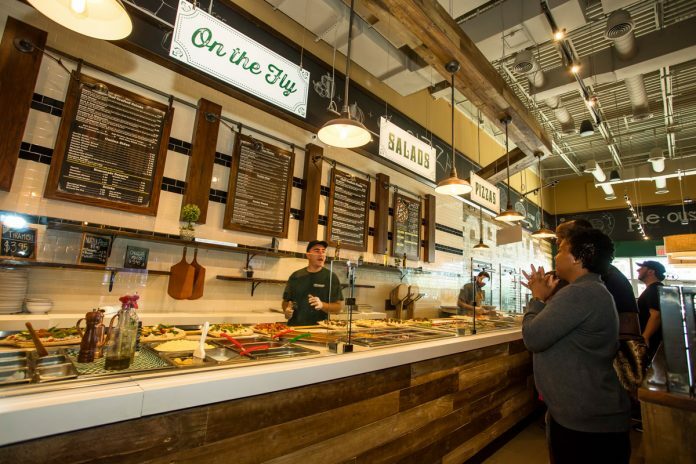 The restaurant is at 1855 Palm Beach Lakes Blvd., Suite B09, in the Marketplace section of the Palm Beach Outlets. My rating: 4+ out of 5.